Colquhonnie Castle is a ruinous remains of a 16th Century L-Plan Tower house of the Forbes of Towie. One of these Forbes Lairds fell from the Castle in the 1600s and haunts the nearby Colquhonnie House Hotel. He is known as The Phantom Piper. In those days it took several days to complete the journey by coach. Today you can reach both destinations from the hotel in little over an hour. A little beyond Forbestown, is the Newe Arms Inn, a large and commodious house for a country inn, kept by Mr M'Grigor. Close by are the remains of the old Castle of Colcpahonie. The walls are of prodigious thickness, and built of rough undressed boulders, now overgrown with grass. It has been of considerable size at one time, and, doubtless, its halls have echoed the clank of many a mailed warrior's tread, in the long forgotten past, and many a fairy form has lightly glided through the dance, or listened to the tales of other years, chanted by the hoary ministry! of the family. Often, perhaps, from that broken old window has the fair white hand waved adieu to the departing lover, whom she might see no more, but she knew that his thoughts would be of her, when he met in the shock of battle, or lay dying in the field of glory. But though these old walls may have witnessed all this, and much more, it is now a complete ruin, with the exception of a vault that is used as a wine cellar. "I am told," adds the same authority, *' that the castle of Colquhanny, in Strathdon [Aberdeenshire], stands upon a weem." This castle, begun by the Laird of Towie early in the sixteenth century, was never finished, but when and under what cirdamstances the underlying weem was discovered is not stated. Perhaps by some accident similar to that which revealed the Airlie weem to the cottar who unwittingly had built his cottage above it. In the case last named it is clear that the underground dwelling had no inhabitants at the date when the newcomer reared his foundations upon its roof. But it is unlikely that the other contingency had never happened, and that invading settlers of another race had never unconsciously placed their habitations above or beside those earth houses while some surviving earth-dwellers were still in possession of their homes. Colquhonny Castle is a 16th century L-plan building in ruins, traditionally never finished. The Name Book (1866) refers to a surrounding moat. Name Book 1866; W D Simpson 1921; W D Simpson 1949. The ivy-clad ruins of a tower-house as described and planned by Simpson, of which only the barrel-vaulted basement remains fairly complete. All traces of a moat have been obliterated by later building. Name changed to Colquhonnie Castle to agree with local rendering. Information from OS (W R) 8 October 1973. Early 16th century. Beside the Colquhonnie Hotel (NJ31SE 85) is a fragment of Colquhonnie Castle, an L-plan tower which Forbes of Towie is said never to have finished. This unfinished L-plan castle is situated on a moderately steep S-facing slope at an altitude of 285m OD. It is in part ruinous and otherwise in use as a store. NMRS, MS/712/43, visited 25 May 1989. (Classification amended to Castle; Tower-house; Moated Site (possible)). 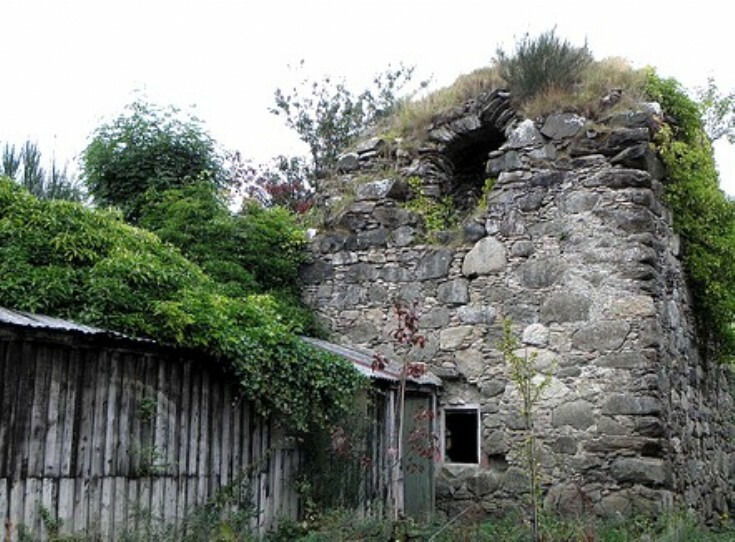 Colquhonnie Castle is a much overgrown ruin of a 16th-century tower-house standing on a terrace between the Lonach Community Hall (NJ31SE 146) and the Colquhonnie Hotel (NJ31SE 85). The Name Book (1866) refers to a surrounding moat of which no trace now remains. L-shaped on plan, the tower-house measures a maximum of 13.7m from E to W by 12m transversely over walls about 1.4m in thickness. The entrance is in the S wall of the return. This opens into a lobby from which access may be gained to the three basement rooms on either side and to the first floor via the stairs that lie straight ahead. The basement rooms are all vaulted and lit by slit windows, although several openings have been subsequently widened. The kitchen occupies the basement room to the NW, and has a large fireplace on the N and a slop on the W. The two other rooms provide storage and there is also a narrow cellar. The first-floor hall occupies the whole of the larger W wing and a vaulted chamber in the smaller E wing has its own fireplace in the E gable, a press on the S and a small chamber in the thickness of the N wall lit by a slit window. A lock-up for a car has been built into the return of the tower-house in recent years, making access to the structure difficult. There is little reason to believe the building is unfinished, as suggested by tradition (O S Name Book 1866). Indeed, it is more likely that the present state of the tower is the result of differential robbing. Colquhonnie was a part of the lordship of Strathdon until 1507, when it was granted to Alexander Elphinstone (Reg Mag Sig). It subsequently came into the possession of the Forbes family and was listed as a gentleman's seat in 1724 (Macfarlane 1906, I, 20). Latterly it was part of the Forbes of New estate, and was described as such on an estate map of 1766 held at Aberdeen University Library (AUL MS2769/I/131/6).